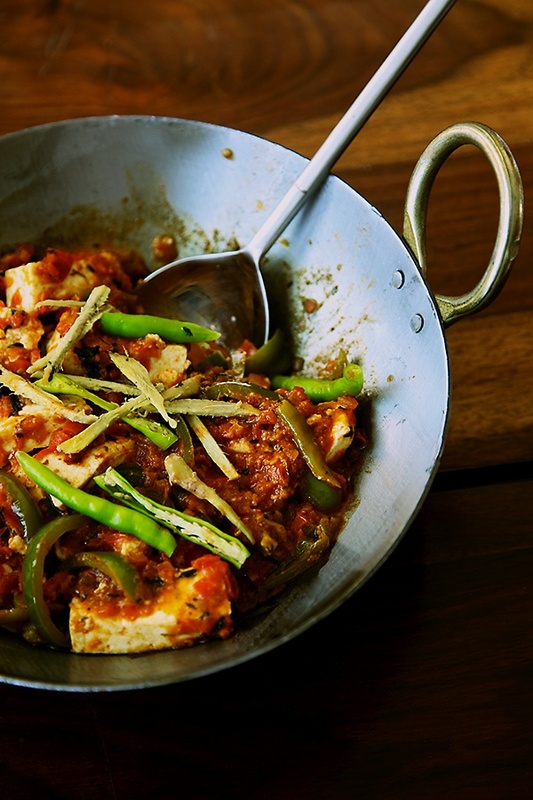 Paneer is one of my favourite ingredients to cook with. Because of its texture and neutral taste, I find that I can use it in a number of dishes, right from pies, tarts, cheesecakes and ofcourse Indian dishes. 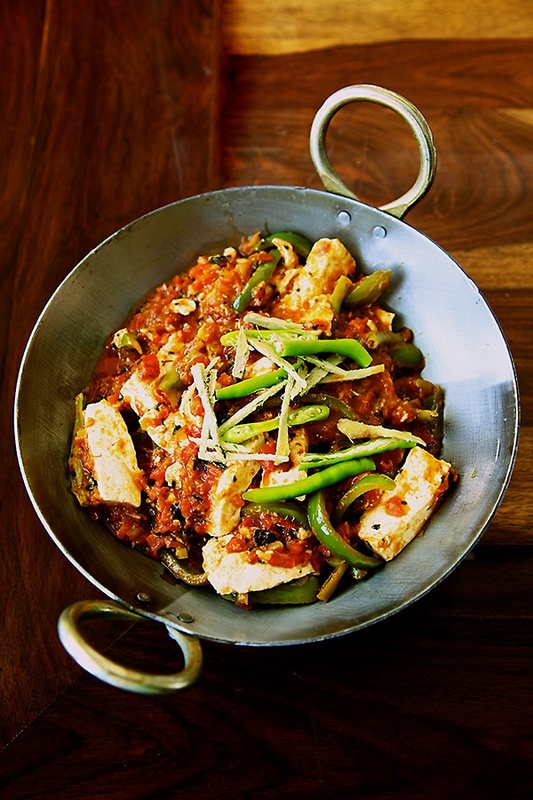 Kadhai Paneer has to be one of the most popular dishes that a vegetarian or a non vegetarian who loves paneer would order in an Indian restaurant. And it is also one of the dishes that I cook the most when I have a special North Indian menu planned for my family or guests. 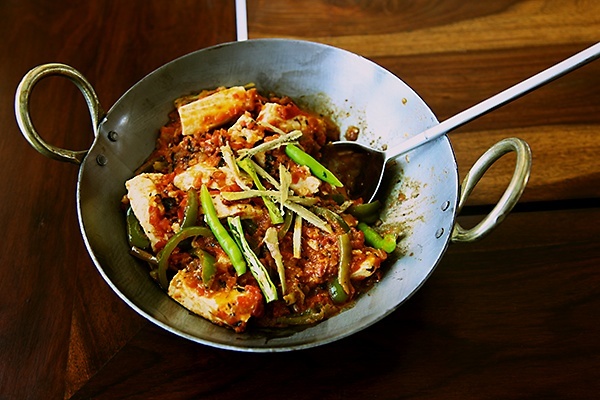 A kadhai is a pan that is very similar to the Chinese wok. It is made from various metal alloys, the most popular ones being stainless steel and iron. Non stick coated pans are also available, but I strictly do not use non stick pans in my cooking. I prefer using cookware made with natural materials instead of the ones with the toxic non stick coating that invariably makes it’s way into the food cooked in it. This has to be one of my quickest photo shoots for divine taste as I couldn’t keep my family waiting for the shoot to get over. Kadhai paneer was a part of the lunch that I served to my in laws who were visiting us along with my special eggplant and potato roast, langarwali dal, jeera pulao, hot phulkas and halva. Hari dashes in to hold a dish with his hands if he is around when I’m in a shoot and this works for me as well as it becomes a wonderful way for me to catalogue the growth of his little hands. The catch to this situation is that he is available for a few seconds only before he races away to get on with his next adventure and this means that I have to act quickly to get the shot. Kadhai Paneer has wonderful aromas and flavours from all the spices and the very essence of this dish is comforting and delightful. I like to use lot of ginger here and this gives a lot of intensity and also provides zest to this dish. 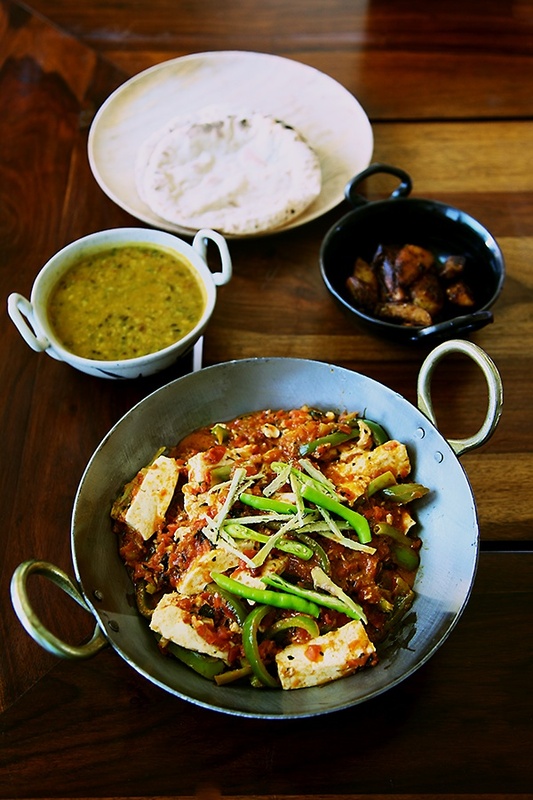 Kadhai Paneer can be savoured with any Indian bread or rice dishes and it can be a part of a simple homestyle lunch or dinner. This dish also lends itself well to an elaborate celebratory meal, perfect for any occasion that needs a good North Indian accompaniment. 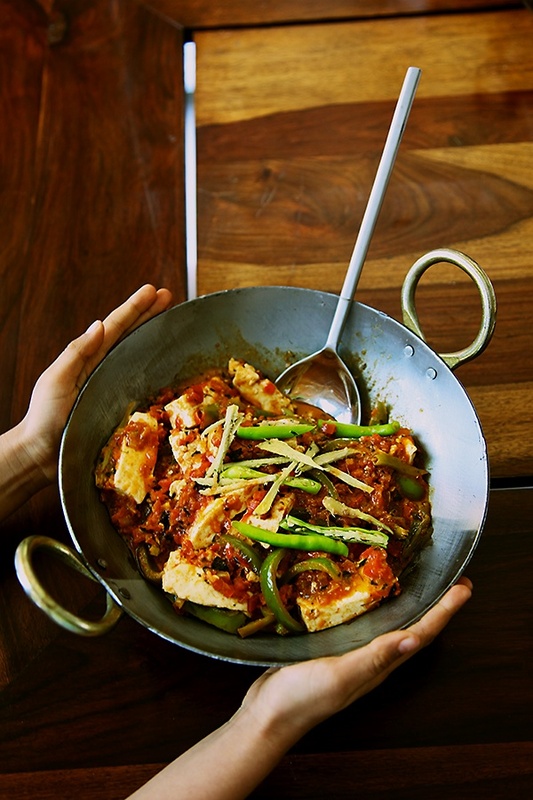 Begin by prepping the paneer and the vegetables. Cut the paneer into fingers and keep aside. Chop the tomatoes into small pieces. Cut the bell peppers or capsicum into juliennes. Grate the ginger and slit the green chilies. In a wok or kadhai or pan, heat the ghee and when it melts, put in the ginger and the slit green chilies. Stir for a few seconds and then add the asafetida powder. Next, put in the chopped tomatoes and cook for 3 to 4 minutes. Then stir in the coriander and red chili powders and cook until the tomatoes are pulpy, about 5 to 6 minutes more. Stir in the bell peppers and cook covered for about 3 to 4 minutes. Gently stir in the paneer, and coo for 2 to 3 minutes more. Sprinkle the kasuri methi and the salt and mix well. Garnish with ginger juliennes and slit green chilies. Serve hot and stir with rice or roti. The little hands are no longer little they are slowly and steadily becoming big…….Isn't it wonderful to watch him grow….precious moments that fill our hearts with joy….before we realise they are all grown up…my little girls too are growing up really fast. Just remembered few lines that I read on this website. The paneer looks very soft ……I am sure you made it at home ….but for days when we are short on time is there a good brand in the market that you can recommend ? Also, as you have experience and knowledge on different subjects specially green living ….could you add a section in your website ( if it's not too much to ask) listing all your recommendations for organic brands/ natural stuff/cookware made out of natural materials/ other ideas to stop our dependency on chemical stuff and the specific places/ websites where they can be purchased from etc. This is just a suggestion…… since you are practicing it in your daily life we could also learn from it and make this planet a greener planet and our lives healthier. Hope you consider this suggestion in the near future. Loved all your videos. Will stay tuned for the next one. Wow!looks simply delicious……your kadai is cute,as I started following DT one by one I have replaced almost all my utensils to steel ,Iron ,copper strictly no non stick even my cooker was replaced from aluminum to steel. Lovely recipe Anushruti 🙂 your pics are a visual treat as usual! Could you please tell me where is the wok from? I'm looking for a similar wok because I dislike nonstick as well! Please let me know soon! TIA. This looks so simple and yummy! Thank you!! 🙂 Will try out your version asap! Can You Please tell me how to make Paneer at home. Shirley- Thanks for the wonderful quote! Hypercity has good, fresh paneer always. And thanks for all your wonderful feedback. Will keep in mind. Look forward to hearing from you always. Shruti- Nice to know that! It's great for your family. Keep up the inspiring cooking that you do for your family. NSJ- Nice to hear from you after a long time! I picked up this kadhai in an exhibition. Unfortunately, this is not sold online or by any store so I'm unable to give you the details. But if you do come across Dastakaar Haath exhibitions, you might find it there. Rama Devi- Hope you like it. Country Oven- You need to bring about 2 to 3 liters of milk to a rolling boil and then add a souring agent, like lime or lemon juice until the milk solids separate and then drain the water off the cheese. You then need to tie the milk solids in a cheese cloth and keep a heavy weight over it and allow the excess water to drain off for about 30 to 60 minutes. You can then cut the paneer into slices and use as desired. did it today. needless to say it was as great as any of your recipes. thanks. Looks lovely and mouth watering too.. Love the pictures along with it. It is a must try at home. Vasumathy: Awesome! Hope you like it. We loved it Anu. Thanks once again. Tried it and came out very well. Your explanation of recipes is very crisp and clear. Really want to try more of your recipes. Your video for this dish was good too. I tried this recipe today and it was yummy! I followed the cooking time as mentioned in the procedure resulting in perfectly cooked, flavourful and juicy bell pepper. Fresh homemade paneer enhanced the magic of this dish. Thank you so much for this amazing recipe. I love to watch your videos, very easy to follow steps. And I am also a big fan of using natural materials for my cooking utensils. And I must say I love your kadhais. I keep hearing you mention yellow asafoetida. Is it different from the regular hing? if so, how? Indu- There are 2 types of hing. One is the made with rice flour and is yellow, while the brown variety has a little wheat flour mixed in it and is stronger than the one which is yellow.